We've made this recipe but it appears Pillsbury may have changed their recipe. In any case, this is a quick and delicious breakfast or snack. Heat oven to 350°F. In ungreased 9-inch square pan, mix brown sugar and melted butter. Sprinkle with pecans. Separate dough into 5 rolls; set icing aside. 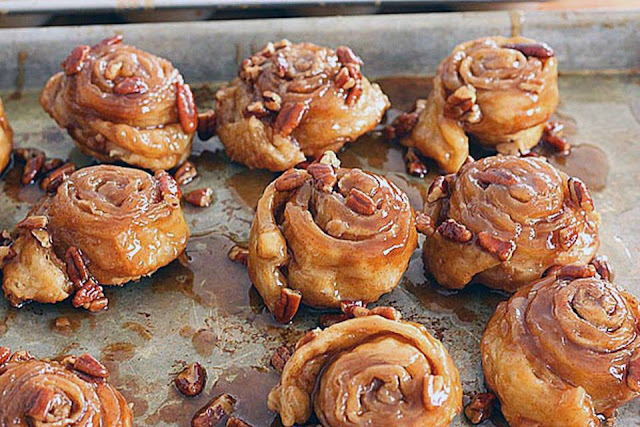 Place rolls on top of pecan-butter mixture in pan.Bake 20 to 25 minutes or until golden brown. Cool 1 minute. Place heatproof serving plate upside down onto pan; turn plate and pan over. Let pan remain 1 minute so caramel can drizzle over rolls. In small microwavable bowl, microwave icing uncovered on High 8 to 10 seconds or until thin enough to drizzle. Drizzle over warm rolls. Serve warm.